The Sandy Lake School District was established in August 1908 and a one-room schoolhouse operated in Sandy Lake (NW9-18-20W) in what is now the Municipality of Harrison Park. By 1917, increases in student enrollment warranted the construction of a second classroom. 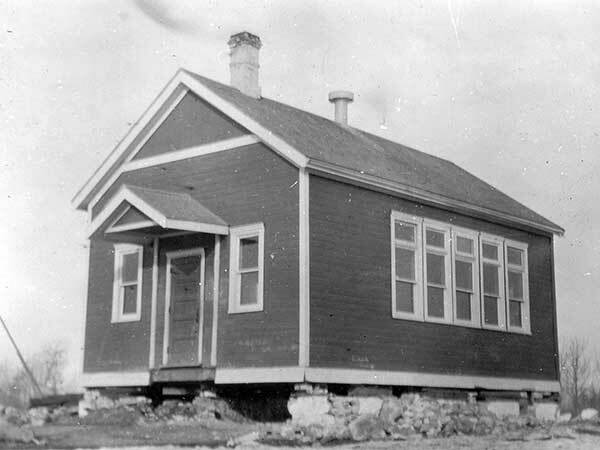 In 1929, continued increases necessitated the construction of a new four-classroom school building at the corner of Railway Avenue and First Street West, that was occupied as of 1930. The original schoolhouse was moved to become the new Pulvers Lake School. In 1959, it was consolidated with several rural school districts, including Mount Calm School No. 772, Jackfish Lake School No. 1367, Martindale School No. 1457, Coldwell School No. 1547, the west part of Rackham School No. 2123, Providence School No. 2184, and Pulvers Lake School No. 2220, to form the Sandy Lake Consolidated School No. 2370. Later districts that joined were Fraser School No. 1301 and Audy School No. 2183. Classes were opened in the basement and, later, in the Community Hall. Sandy Lake became part of the Rolling River School Division and, in September 1961, a new four-roomed Collegiate opened to high school students. It had a library, gymnasium, and science laboratory. A fifth classroom was added in 1963. Students in grades 10 to 12 were later bused to Erickson Collegiate. The old school was closed in October 1975 and all classes were held in the former Collegiate building. The building was sold and dismantled in 1977. The other teachers of Sandy Lake School (1909-1982) were Ethel Grover (1909), Elza Bryant (1910), Percival Leighton (1910), George Campbell (1910), W. W. Crosby (1911), Robert Walton (1912), Myrtle Moon (1913), Katie Johnson (1916), E. Isbister (1916), Annie Allanson (1917), Irene McJonnet (1917), Anna Smartwood (1918), Thomas Lilton (1919), F. C. Saunderson (1921), J. B. Shere (1921), G. Gardner (1921), M. McKay (1922), Helen Muir (1921), S. A. Amjott (1921), A. E. Burkett (1921), Jane Chapple (1921), Dorothy Greaves (1922), Gladys McBray (1923), Eloise McKenzie (1923), L. McKenzie (1924), Earl McKellar (1926), Jessie Smith (1927), Emma Ek (1927), William Wallace Wright (1927-1929), John S. Dickison (1928), Edna Lund (1928), John Cameron (1929), Nadia Boyaniwski (1929), Matilda Presumka (1930), K. Greenway (1930), Wesley Patterson (1931), Evelyn Dean (1931), Wilma Hamilton (1931), Marie Rudka (1932), Valerie Karpetz (1932), Emily Goodchild (1932), Frank Woycheshin (1933), Francis Kurys (1933), Clayton Bricker (1933), Mary Bachewich (1936), Anne Bosiak (1937), E. M. Surby (1937), Ann Bodnar Kristalovich (1938), H. D. Gensberg (1940), N. Dunita (1940), Lillian Gregorash (1942), David Iverach (1942), G. M. Csuzdi (1942), Anne Lacroix (1943), K. Michalchuk (1943), Olga Hyrsak (1943), Philomene Lacroix (1944), Julia Hasiuk (1944), Nick Pereski (1945), Mrs. A. Pereski (1945), Mrs. J. M. Kwiatkowski (1946), Bill Pauluk (1946), Olga M. Kowal (1946), Melvin Borody (1947), Oriel Kostynuik (1947), Tillie Karleski Rystephaniuk (1947), Anne Berezowsky (1947), Pearl Bayduoza (1949), Leo Gendreau (1950), Morris Boychuk (1951), James Cliffe (1954), Emily Paswisty (1954), Cassie Misanchuk (1955), Marjorie A. Robinson (1955), Enid Wallace (1956), N. Kristalovich (1956), Helen Kukurudza (1958), Nickolas Pereski (1958), Ann Pereski (1958), O. A. Perlett (1959), Doris Loganburg (1959), Michael Shewchuk (1959), Victoria Ellchuk (1960), Kathy Zachary (1960), Edward Sichewsky (1960), Lynne Mault (1961), R. R. McCurdy (1961), Jack Ziprick (1961), Robert Syrnyk (1961), Ida Favelle (1962), A. Twerdochlib (1962), Stan Boguski (1962), L. Romantz (1963), Gerald Butler (1963), Don Johnson (1963), Lester Hurse (1963), Olga Kowalchuk (1964), Judith Yakusik (1964), Joyce Thompson (1964), Moody Roebuck (1964), Susan Yanik (1964), Dennis Wishnowski (1964), Frank Peters (1964), Mr. Gilleshammer (1964), Mary Saranchuk (1965), Joyce Coulson (1965), Eleanor Tereck (1965), Shirley Sheeska (1965), Gerald Diswinka (1966), Henry Tkatchuk (1966), Mike Geletchuk (1966), Linda Squance (1966), Brenda Trelenberg (1967), Hazel Michalchuk (1968), Evelyn Shindruk (1968), Dorothy Warwaruk (1968), Leona Mackedenski (1969), Olga Kowalchuk (1969), Twyla Travelyan (1971), Pam Lewandoski (1972), Ernie Burdeniuk (1973-1974), John Montgomery (1975), Gaeta Shaw (1979), Linda Hall (1980), Sharon Furman (1980), Tom Crew (1980), Robert Bjarnason (1981), Jack Coulson (1982), and Muriel Koscielny (1982). GR8461, A0233, C131-2, page 123. Elphinstone East topographic map, 62K/9 East, Edition 1, Series A743 [Archives of Manitoba]. 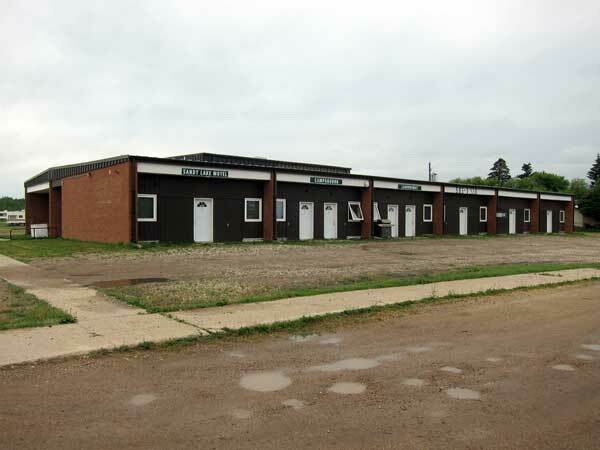 Sandy Lake School by Ed Kowalchuk, Winnipeg: Trident Press, 1993. We thank Nathan Kramer and Audrey Bamber for providing additional information used here.